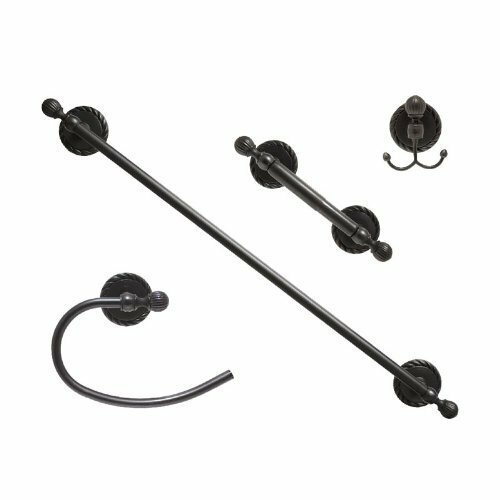 MODONA 6900-A-B Four Piece Bathroom Accessories Set Rubbed Bronze Victoria Series by MODONA at UCBC Group. MPN: 6900-A-B. Hurry! Limited time offer. Offer valid only while supplies last. MODONA's Four Piece Bathroom Accessories Set will help you transform your bathroom into the bathroom of your dreams. Beautiful Rubbed Bronze Finish. MODONA's Four Piece Bathroom Accessories Set will help you transform your bathroom into the bathroom of your dreams. Beautiful Rubbed Bronze Finish. High quality and easy-to-install, feel confident with MODONA products. All instructions, mounting hardware and allan wrench are included. The toilet paper is extra tall to accommodate even big or thick toilet paper rolls and the roller is made of Stainless Steel, NOT ABS Plastic as most other brands. The towel bar pieces are made of high quality stainless steel, not Zinc or Aluminum which is much more prone to dent or bend. Please search "Victoria Series" to see all the other matching items in this series, including: Frosted Glass Soap Dish, 24" Double Towel Bar, and 20" Frosted Glass Shelf. This series is also available in POLISHED CHROME and SATIN NICKEL finishes.